Will you guys just take a look at the beauty that is this dang 1st birthday?! 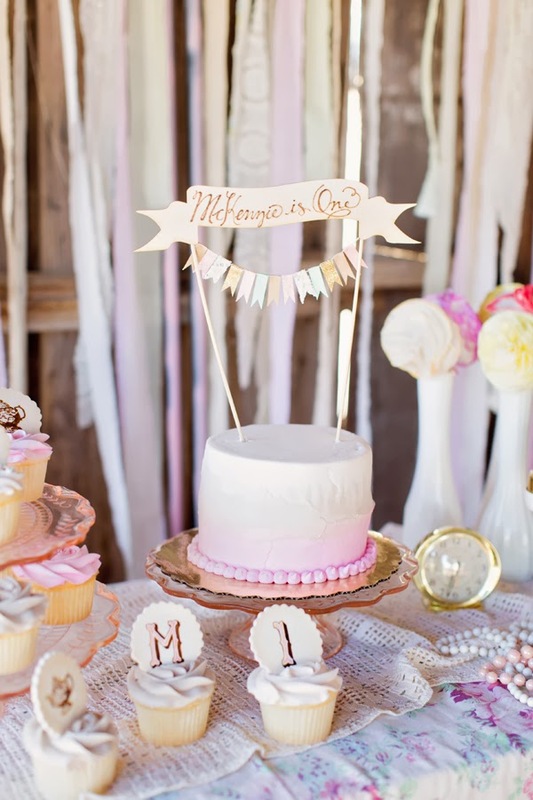 The extremely lovely Melissa of, Fawn Over Baby, just celebrated her little one's first birthday! Happy 1st birthday McKenzie! I'm just in utter awe at the cuteness! Her theme was "vintage tea party" and she hit the nail on the head in that department! Everything went together perfectly! She asked me if we'd be interested in creating some cute little cupcake toppers and as soon as I heard the party's theme I was in. I mean, come on. Too fun! With a few pictures of her party invitations and decor ideas, we knew exactly where we wanted to go. So, we created a dozen 2" white scalloped toppers, hand painted with "vintage" M's, 1's, and teapots. We stuck to the hues shown on her party invites for all of the colors, and I "antiqued" the edges with some plain 'ol cocoa powder to give each topper a bit of a more vintage/old feel. How cute is McKenzie?? And that golden floral headband?! Gaaaw! I just love how everything tied together so perfectly!!! Interested in getting some hand painted cupcake toppers, yourself? Head on over to our shop and give me a little ring! For more adorable pictures and info about all the vendors at this party, please head on over to Fawn Over Baby! They just get cuter and cuter! And Melissa- THANK YOU for trusting us to be a part of your little baby's big day! Awww these photos look even cuter on your beautiful blog!! Thank you so much for creating these decadent delectable beauties!! I swear I want to frame them...like, the actual toppers, lol! They are truly a work of art and yummy too!! I'm so gitty over how perfect they went with this sweet little theme!! Thank you! Thank you! You are so welcome and THANK YOU! We had so much fun doing these!! I loved her photos from this party <3 such a sweet celebration. and GIRL! Those cupcake toppers look amazing! Thank you, sweet friend of mine! This is lovely! I especially love the gold headband! Isn't little McKenzie just the cutest? !